Powder Paints Dedicated Extruder KEXP Extruder | Product Information | KURIMOTO, LTD. 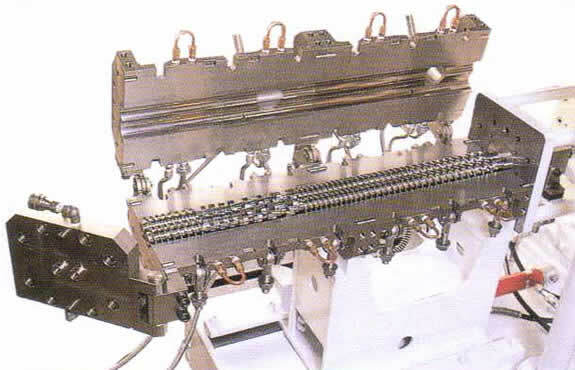 The Kurimoto KEXP series extruders are a two-shaft continuous kneading machine specially designed to meet the needs of functions for key steps of thermosetting resin powder paint manufacturing process, such as melting, kneading and dispersing steps, which therefore can be called a processor dedicated for powder paints. Minimal retention of raw materials inside the barrel enables no production of gelled paint. Superb self-clearing capability is provided between screws and between the barrel internal surface and screw. Minimal dead space at the raw material discharging section provides prompt discharging. The cooling jacket of the barrel has a structure enabling efficient cooling (heating). The shaft cooling can be performed from the screw side. The barrel is two-segmented into upper and lower parts. The upper part can be opened and closed easily by a hydraulic cylinder. Standard barrels have a liner structure of Kurimoto's special wear-resistant steel (CHST). The liner is two-segmented into for upper and lower parts and further 4-segmented in the shaft direction, enabling you to replace only wear parts. Ability to support high-torque operation is provided. Vertical forced feed unit is equipped with the raw material hopper. Copyright © 2014-2019 KURIMOTO, LTD. All rights reserved.